Start Using the Yay LED Downlights that will save you money on your big electricity bills and time of changing bulbs frequently. the led down lights provides high light output with minimal power usage and will last 36,000 hours or +16 years. • Ultra slim low-profile, white acrylic lens. 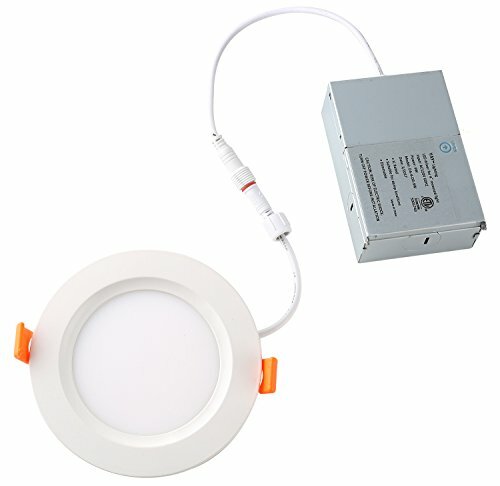 • Round ceiling-mount LED light panel. • Approx. Lifespan of 36,000 hrs. • Low Profile to fit in 3 3/4" ceiling hole with 2" space. • No UV or mercury. • Resistant to Shock and Vibration. • Significant Energy Saving of up to 80%. • Simple Plug & Play Retrofit Installation. • Reduced Energy and Maintenance Cost. • Compatible with select Sensor switch dimmers. corridors, nursing homes, condos, elevators, apartments, etc. The Yay LED spotlights works on 120V AC power supply. It just consumes 9W standard input wattage providing 90 lumens per watt. • Our LED lighting is proudly certified by most standardizing authorities.• US and Canadian safety standards.• Air Tight certified in accordance with ASTM E283-2004.• ETL LISTED (compatible with UL & CSA List). NOTE: Actual performance may differ because of end-user environment and application. All values are measured under laboratory conditions at 25 °C. Order Today the Highest Rated Ceiling Light by Clicking on "Add to Cart" before it runs out of stock and Experience the High Light Output with Minimal Power Usage.